Choosing the most appropriate exercises for your client can be a challenge, even for the most skilled exercise and rehab professionals. Not only are you assessing the array of exercises to use for a client (see part 1 of our three-part series), new technologies arriving every day plus the unique physical condition of your client must always be taken into account too. In part two of our three-part series about the seven steps of the CHEK strategy that pinpoint the best exercises, you’ll learn how C.H.E.K practitioners help their clients achieve results faster and more safely by starting with the most complex challenges, then combining several tasks into one exercise. To show you how useful these principles are, for this series, I’m using a short, fictitious case history describing Sally, a 35-year-old surgical nurse and a mother of three young children, to demonstrate how they work. During your initial session, Sally tells you that she wants to reduce body fat and alleviate the chronic back pain that has persisted since the birth of her third child. Exercise selection is one of the most important skills for exercise and healthcare professionals to master. Proper use of this principle has a massive influence on the rate at which a client achieves his or her goals. Unfortunately, due to undue influence from the bodybuilding and machine manufacturing industries, trainers and physical therapists opt for machine- or floor-based or isolation exercises when most clients can comfortably handle exercises that are more functional and biomotor rich. In most instances where functional tasks are involved (meaning the client is unsupported and self-balanced), we will reap the greatest reward in the shortest period of time through the use of Primal Pattern® Movements, movements or patterns of movements that had to be performed efficiently in order to survive in our native (primal) developmental environment. To reduce the complexity of choice, we can correlate which movement patterns are most essential to the needs of the client. In Sally’s case, she must improve her functional strength when bending over the operating table. Bending and lifting are also essential to a nurse’s ability to transfer patients from one bed or gurney to the next. For Sally, a freestanding Bent Over Row would be the natural choice. This exercise serves her in several ways, as it conditions her in the exact pattern in which she needs improved strength-endurance, allowing optimal transfer to her work environment. Also, given that Sally has low back pain, you need to be aware of possible reactions from this exercise, and should have alternative exercise options available. Additionally, we must not forget that Sally’s other goal was to reduce body fat. This takes us to Principle 4. Load the body in multiple planes of movement. Produce results in multiple biomotor abilities. Generally provide the greatest potential outcome for the time invested. Principle 4 can be successfully applied to Sally in a number of ways. For instance, if she has discomfort with the Bent Over Row and you are unable to load her adequately to get the response you want, choose a different Big Bang exercise. In Sally’s case, I would opt for the Supine Lateral Ball Roll. 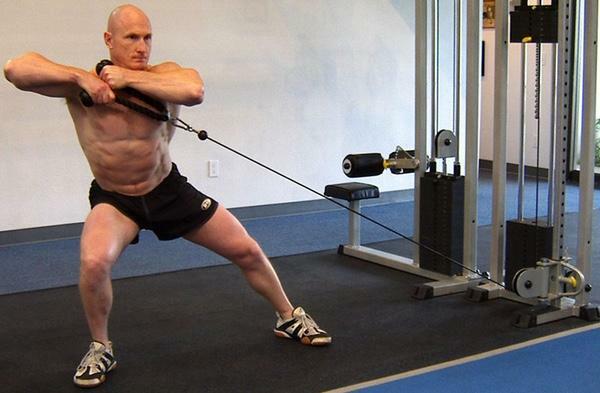 This versatile exercise is not manipulated solely through the use of acute exercise variable. As Sally develops strength-endurance in the correct muscles for the demands of her job, it also serves as an effective inner unit/outer unit integration exercise. The exercise is performed in a supine position, so it is non-compressive. 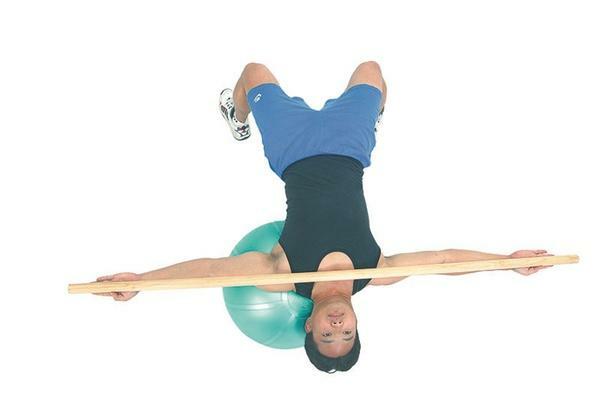 It also uses a Swiss ball, so strength and endurance is improved in all planes (sagittal, frontal and transverse). Several biomotor abilities are targeted – strength, endurance, coordination, balance and agility — all of them hallmarks of a Big Bang exercise! Using pull patterns on a cable cross machine set in the low pulley position. Using an alternating arm action. Using a single arm action (complete all reps on one side, then switch to the other arm). Be aware these modifications would increase the biomotor richness of the exercise, which would, in turn, activate more muscles to stabilize the body and move the load. More muscles equal a greater caloric demand and so such modifications improve the fat-burning potential of an exercise! The final chapter of our three-part series shows how to help your clients safely integrate these exercises, then apply them using the correct reflex pathways.